When it comes to your business, knowing what sells and why is key to boosting bottom line profits. Preferably, you pay enough attention to get a bit ahead of the trends so you can directly create demand for your products. Even so, food trends can be fast and fickle and it can be tough to keep up with shifting demands. Growers who really know their greens have the opportunity to drive trends with their culinary customers or farmer’s market shoppers; not simply react to them. Use these tips to ensure you’re in the driver’s seat. An overall concept that is pushing current food trends right now is sustainability in our food system. In addition to a focus on health and wellness, many are striving to be more sensible and less wasteful in their cooking habits and when creating new dishes. Chefs and home cooks are looking for ways to squeeze the most out of their local produce; that means coming up with creative ways to use the parts we typically discard. Using all parts of the vegetable, including the peel and the green tops, is an emerging culinary practice. It’s more than just about sourcing local produce, Brun says. It’s about better supporting the local economy. “Our local chefs go out of their way to source as much as possible from their region. Even our wholesalers have adopted a ‘local’ program in which their customers can choose to buy our microgreens and other locally sourced produce,” she says. They all work together to promote their industries and educate customers. Lucky Leaf Gardens currently sells to area chefs and local grocers such Harris Teeter, Whole Foods Market and Healthy Home Markets. It’s no secret veggies have moved from the side dish to the entree plate. But is it the consumer or the chef that’s driving the demand? For Lucky Leaf Gardens, it’s their chef customers who are driving the majority of their business. When they started the business, Brun says they were only growing four varieties of microgreens. Now, they grow more than 50, and all suggestions and requests originate from their chef and restaurant customers. 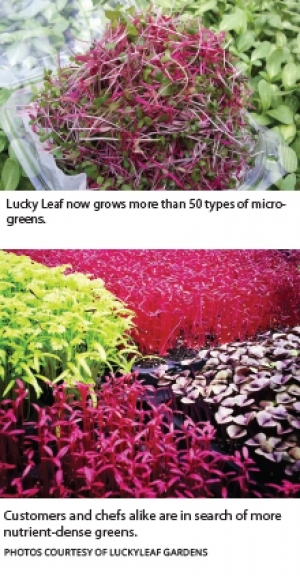 However, as curious chefs have requested unique greens from Lucky Leaf Gardens — and in turn introduced them to their dining customers — an additional customer base was born. Savvy diners began to seek out the unique greens themselves and now Lucky Leaf Gardens sells direct to these retail customers. 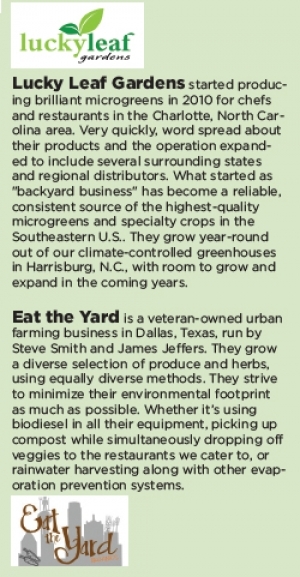 Steve Smith, owner of Eat the Yard, a clean-greens urban grower in Dallas, Texas, told me he feels the chefs are still creating the trends and his job is to grow the items that help them stand out. “Our newest this season is a Japanese white turnip that's out of this world,” he says. Diners have gotten a lot savvier about their salads lately. They are well aware that not all salads are healthy once assembled, and they now expect a bigger variety of nutrient-dense ingredients. Iceberg or romaine with some cucumbers and ranch dressing just doesn’t cut it anymore, nor is it very nutritious. Consumers now want to see a variety of well-thought-out ingredients, local produce and healthier dark greens. Unusual greens, dense greens typically reserved for the stovetop, and microgreens are commanding a lot of attention right now. Sturdy greens, like collards, aren’t only for the stew pot anymore. They have started making an appearance in fresh salads. Shredded or finely sliced, they add a filling texture to the dish. Collard greens will also stand up to mixing with sturdier salad ingredients, such as broccoli, potatoes and grains, which are becoming more popular as healthy fixings. With about twice as much nutritional value as standard lettuces, they’re bound to gain popularity at the salad bar. On the flip side, beet greens are making the jump from the salad bowl and juicer into the braising pot. Beet greens are being used as a more colorful alternative in recipes typically dominated by collard and turnip greens. If you haven’t noticed, wilted greens are a thing now. Grilling, charring and braising salad greens has become a popular trend at restaurants, and chefs need greens that can hold up to the heat. While small loose leaf green mixes have dominated the market for quite some time, chefs are now looking to grill and serve intact heads of romaine, butter lettuce and endive. They also want sturdy kale and spinach for flash-frying. A bit of burn on salad greens is no longer seen as a bad thing; it’s desirable. Both Lucky Leaf Gardens and Eat the Yard now offer a 'braising mix’ specifically for chefs offering wilted salads, grilled salads or a more diverse menu of cooked greens. The mixes include greens of mustards, kales, and beets. While baby vegetables aren’t exactly what we’d consider a new or fashionable food trend at the moment, there is still plenty of demand for them. Brun says that in addition to microgreens, they also grow lettuce; but her chefs want them petite and juvenile. “Petite,” to be exact, she says. “We grow carrots and other root crops, though our chefs want them to be pulled well before they mature,” Brun says. Tiny veg apparently still has some cache. Variety and nutrition aren’t the only economic drivers when it comes to demand for specialty greens. Organically grown, non-GMO produce is in big demand. Lucky Leaf Gardens produces everything organically (their certification is in the works) and uses only non-GMO seed. They’ve also chosen an organic soil-based production strategy over hydroponic production. Eat The Yard also produces all of its greens using organic growing methods. They use what Smith calls a “closed-loop system” to keep a sustainable, environmentally conscious farming model. “We use restaurants' vegetable and oil waste to compost. We use this compost to grow more vegetables and to make bio-diesel that powers equipment and the delivery truck,” she says. The goal, Smith says, is to provide clean, flavorful and nutrient-dense food that he feels is difficult to find. It’s just these kinds of resumes chefs are looking for from you when ordering your fresh produce. If you want to stay on the cutting edge of demand with your edible crops, you should get involved with your local culinary groups in a meaningful way. By immersing and including yourself in their world, you’ll gain access to top chefs and get to know exactly what they’re looking for when shopping produce. Brun claims membership in a prestigious local group, the Piedmont Culinary Guild. 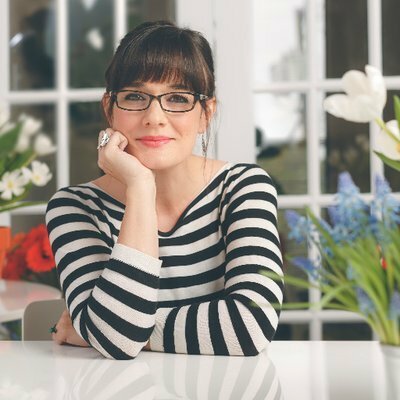 Within this group, she’s able to mingle with chefs, artisans and other farmers to help drive the market. “This is what keeps ‘specialty greens,’ like microgreens, in the spotlight,” she says.